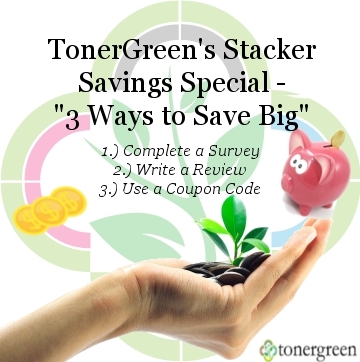 TonerGreen's Stacker Savings Special - 3 Ways to Save Big | TonerGreen - Eco-Friendly Toners from the U.S.
TonerGreen.com is your online provider of eco-friendly printer cartridges and other environmentally responsible printing solutions. Our primary product line include U.S.-made premium remanufactured toner cartridges and remanufactured inkjet cartridges for known printer brands like Brother, HP, Canon, Samsung and other major printer brands. But aside from offering environmental-friendly printer consumables in its campaign to Go Green, TonerGreen also aims to help you save some green. As a sign of gratitude for your continued patronage, TonerGreen introduces you the Stacker Savings Special. For this week only, earn up to $10 in store credit and also take 5% off any order (excluding OEM products). So how can you avail this special promo to save big on your next order? Well, you just have to complete these three easy steps. Complete a Survey - At TonerGreen, we're always looking for the best way to serve our customers that's why your feedback is important to us. It's the most valuable information we can use to improve our store and service for your convenience and satisfaction. By completing this short survey here and submitting it, you can automatically get a $5 store credit on your account. Write a Review - Are you happy with your shopping experience at TonerGreen.com? Share your review and you will get another $5 store credit on your TonerGreen account. Just simply sign up on ResellerRatings.com and write a positive review for TonerGreen.com here. Use a Coupon Code - To top all off the credits you can receive, TonerGreen is offering an additional 5% off your entire order. Just key in the coupon code STACKERS. As the name implies, you can stack this coupon with all the credits you've earned. These are the three ways you can do to save big. There are no minimum order required, plus get free-shipping on orders $50 or more. TonerGreen.com is your best choice if you want to help the environment and save some cash. Going Green while saving some Green is made easier by TonerGreen.com.